AOS, Inc., dba TradingBlock ("TradingBlock") has prepared this report pursuant to a U.S. Securities and Exchange Commission Rule 606 requiring all brokerage firms to make publicly available quarterly reports on their order routing practices. The report provides information on the routing of "non-directed orders" – any order that the customer has not specifically instructed TradingBlock to route to a particular venue for execution. For these non-directed orders, TradingBlock has selected the execution venue on behalf of its customers. 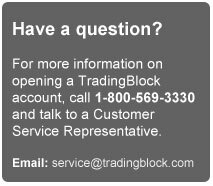 As of September 10, 2010, TradingBlock cleared all of its customer trades through Penson Financial Services ("PFS"). On or about June 6, 2012, Apex Clearing Corporation ("ACC") assumed the clearing operations of PFS. Non-directed stock orders, and a non-directed option orders received by TradingBlock are routed through the clearing firm's routing system with TradingBlock responsible for selecting the execution venue. TradingBlock's routing report addresses the routing of all of these non-directed customer option orders. Please refer to the routing report below. Separate sections of this report identify the venues most often selected by TradingBlock when routing customers' option orders and sets forth the percentages of various types of orders routed to each venue. TradingBlock has additional relationships with certain venues to which it routes option orders, and does have "payment for order flow" or "profit sharing" relationships with such venues.